It’s officially summer in the Adirondacks, and that means… well lots of stuff. To me, summer means biking, hiking, swimming, paddling, climbing, and touring. The season also includes everyone’s favorite way to prepare for, or recover from, all of those activities. No, I’m not talking about napping. Even better, I’m referring to picnicking. So, where to picnic, you ask? There are so many day parks and spaces that are open to the public, with spectacular views of the mountains, right along lake shores or adjacent to the rushing rivers that it’s tough to choose. As such, for our collective convenience, following is a selection of 8 pics of picks for picnics, (most of which include an iconic paper plate, indicating the location's picnic-friendliness). 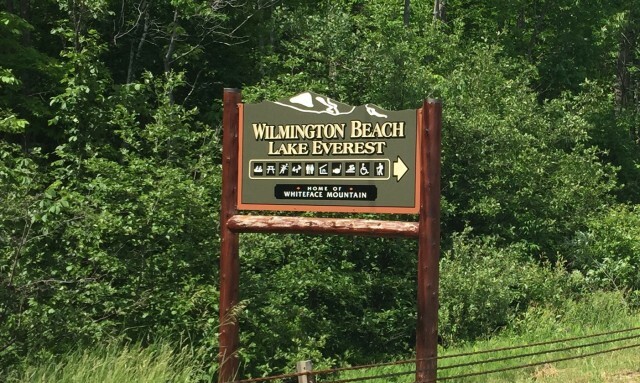 For geographic reference, these spots all happen to be found along the route identified as the Rapid Descent Trail, a driving or cycling tour that traverses along the roads from Upper Jay to Jay to Wilmington. 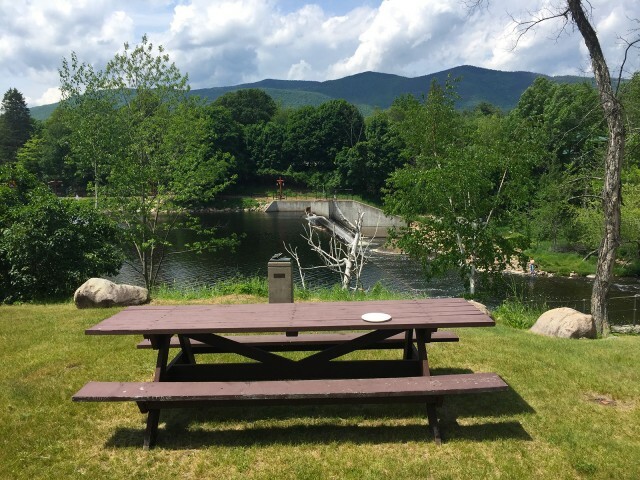 So without further ado, here are my top 8 places to dine al fresco in the Whiteface Region. 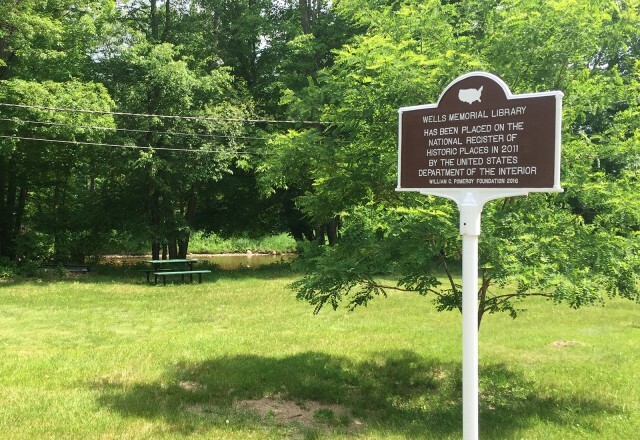 Just north of the junction of 9N and Springfield Road in Upper Jay, you’ll find the Wells Memorial Library. The building is on the national register of historic places, and we’re fortunate that the library reopened in 2012 after nearly being destroyed by flooding during 2011’s Tropical Storm Irene. The close proximity of the river that rose during that storm now provides a great backdrop for a picnic on the lawn adjacent to the library. 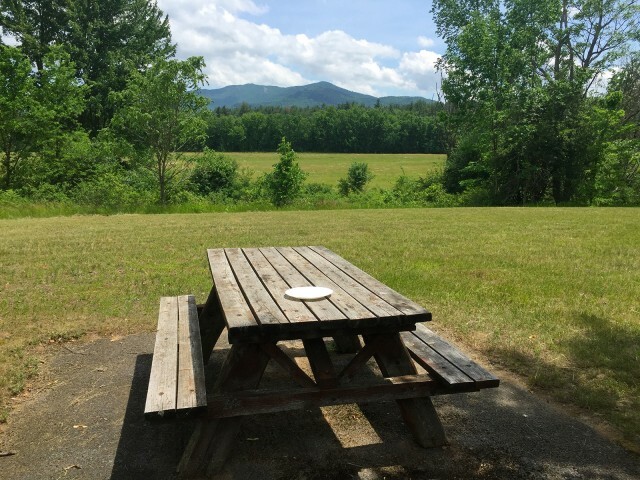 Another couple of miles north of the Library, there’s an obvious pull-off with a number of picnic tables and amazing panoramic views of the Jay Range. 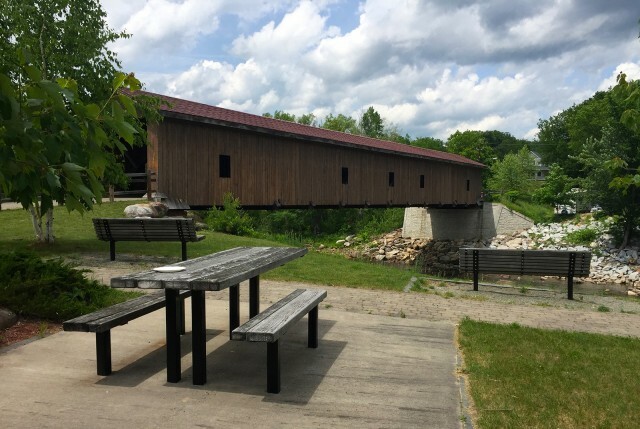 A terrific picnic location at one end of the historic Jay Covered Bridge, it’s one of my favorite cycling stops, too. 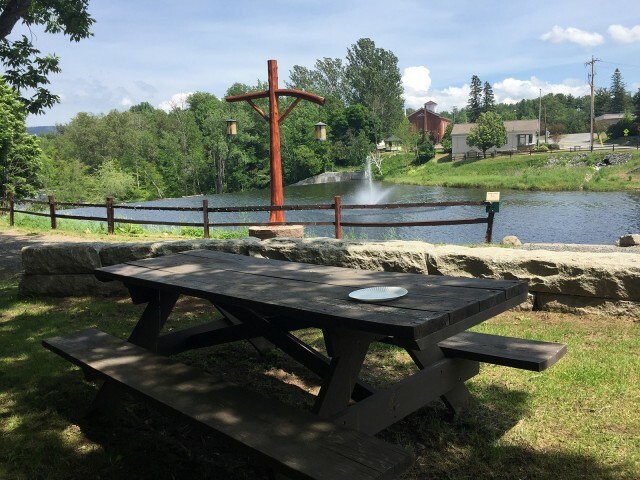 Located adjacent to the Whiteface Region Visitors Bureau, your picnic here can include a selfie with the bears and benefit from the wealth of travel expertise available inside the information center! Within a short fly cast of Heritage Park, you’ll find the Bridge Park, which is coincidentally located near and with views of, the bridge. Here you’ll also find an art installation of giant fly-fishing hooks dedicated to local icon Fran Betters. This is a great spot if you’ve got young ones. I found a shaded picnic area off to the side, with a good view of the playground, and close proximity to the bicycle skills area, skateboard area, tennis court, basketball court, and the softball/baseball field. 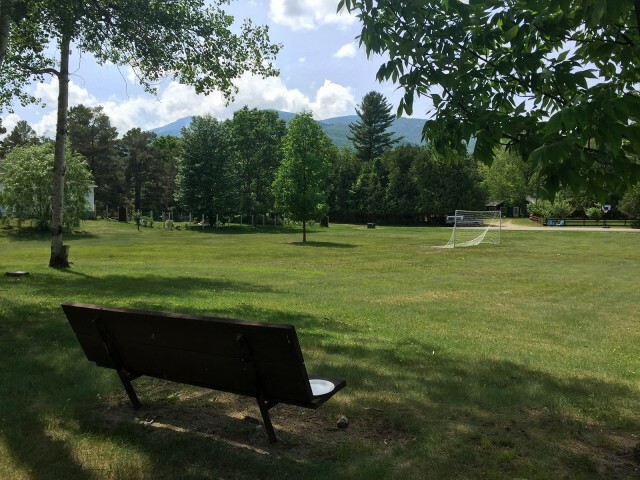 There is no picnic table (that I could find), but I like this location with its view of Whiteface Mountain enough to deem this a picnic bench. Located off Springfield Road, this is also the location of the annual Festival of Colors, a hometown celebration of fall that’s held each September. This might be the piece de resistance. 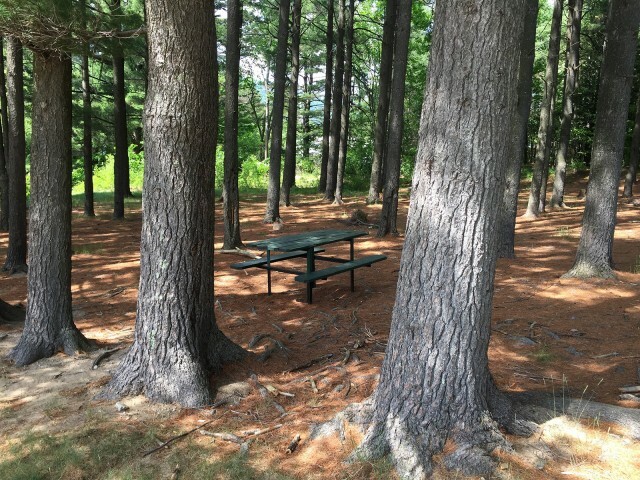 A wonderful sandy beach on the Ausable River, with a boat launch, playground, bath house, and several picnic tables. 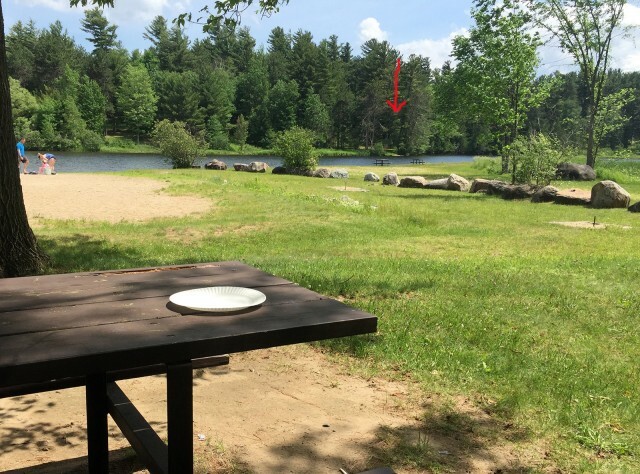 Bonus points for snagging the two right on the water (follow the red arrow)! While in Wilmington, be sure to notice the attractive park signs at all of the public parks – with landscaping that is maintained by a generous local volunteer, complemented by new, attractive light posts as well. A very nice welcome, indeed! Need picnic supplies? Try the famous sandwiches from Little Supermarket, peruse the North Pole Gift Shop’s variety of beers, order takeout from the A&W Restaurant, or try any of the region’s fine grocery and convenience stores. Remember, taking a break between meals is recommended, so you’ll need to stay for a few days. Lucky for us, there are a bunch of lodging and camping options!